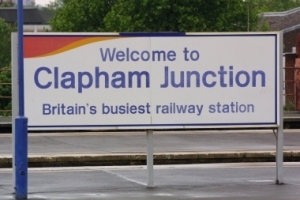 The government has just announced that Clapham Junction, with 9 other railway stations in England, most in need of modernisation, are to get £50m to carry out urgent improvements. Already last week, rail operator Network Rail announced plans to spend £3.25bn to improve more than 2,000 stations across England and Wales by 2014: this includes Birmingham Station, but also Leeds, Blackfriars, King Cross… (diaporama on the BBC website). But Chris Green (appointed by the government to look at the railway – former Virgin Trains chief executive) and Town and Country Planning Association president Sir Peter Hall – have identified 10 that are in need of the most urgent work and that they described as having been “left behind“. Manchester Victoria was judged to be the worst followed by Clapham Junction and Crewe (customer satisfaction ratings), with all three suffering from overcrowding. The station badly needs a new entrance which links into the overpass, relieving pressure on the congested tunnel linking the platforms, and this is now proposed. Local controversy has focused on the extent of commercial development around the station needed to generate the income for the station upgrading. You can read more comments on his tour on the Timesonline website. “I support the report’s recommendations of minimum standards for stations – classed by size – in terms of information, car and bike parking, facilities and environment. He also added that rail operators would be required to ensure minimum standards in future. It is good news for Clapham Junction, at the time where we have just launched an initiative to debate on the redevelopment of the station. “The Government is already installing lifts and building a tube station at Clapham Junction, but it’s still a very overcrowded, old-fashioned station that is in urgent need of better facilities for travellers. The new entrance opening soon at the top of St John’s Hill will give direct access to the lifts and this will be a huge bonus for the public as well as for people with wheelchairs, buggies, bikes or heavy luggage. But my top priority is to give access to the lifts from the Grant Road side of the station as well. Together with the Clapham Junction Action Group I will also press for a bigger main entrance with more ticketing facilities and with escalators from the concourse to the overbridge to relieve overcrowding in the tunnel. We’ve expanded the capacity of Clapham Junction from four-carriage to eight- and ten- and eventually to twelve-carriage trains, and we need more entrances and facilities and escalators to ease congestion and to make travelling a more pleasant experience. I know that all the people who objected to the 42-storey towers were still keen to get the station improvements and I’m delighted that the Government has come forward with some funds to pay for the most urgently needed improvements. There’s no reason why we should have to pay for urgently-needed station improvements by agreeing to giant tower blocks which would be totally out of place and I’m glad we didn’t agree to the scheme. It is exciting to see that things are moving, and fast. We hope to be able to meet with Network Rail as soon as possible to discuss on the new possibilities. £5m or more is expensive for paint, and I wonder then how you could call the £300k that WBC put aside to help improve the new station entrance: a droplet? Seriously, why not simply say, as we press for, that this funding is welcomed, and we hope that it shows concerns at the government level and that it will be followed by additional funding to eventually make a proper redevelopment? Its fantastic news that the problem is finally getting the recognition it deserves, I just hope we get these improvements sooner rather than later! Will> The question is in your sentence: “these improvements“…. what are they? I think we have to tell NR what are users concern and make proposals, instead of fighting back. That’s what the CJAG is concentrating on and we will be launching a consultation soon. (2) that improvements are needed NOW, and not in 4-5 years time. stage 2 to improve the facilities south of the tracks with a new station building linking overpass and underpass and extending the access between platforms (whether by means of widening the underpass, or by the provision of a new access between platforms). Stage 1 appears to have been taken firmly on board. Let’s continue pressure on this and press for stage 2 receiving funding as a major priority in CP5 (2014). How can we say less than: the cash boost is good news and we hope that more will come? I am sure you meant to say it is an ‘understatement’ Cyril! “It is a shame that the Council is not welcoming this news. Even if Clapham Junction only receives a tenth of this funding, this is still £5m more than was initially earmarked for this spending review period (i.e. up to 2014) and will hopefully buy more than a ‘lick of paint’. Lord Adonis referred to the need to link subway and overbridge north and south of the tracks, and it is our hope that the funds will go some way to enabling a new station in Grant Road to achieve this. Anyone can comment on the Wandsworth article by following the link in Cyril’s piece above. Prompted by today’s article in the local Guardian, I’m wondering why you refer to ‘building a tube station’ in this way. Are you perhaps referring to the ELL phase 2 extension – which was part of the tube network before closure for rebuilding? ‘Connecting to the tube’ via the ELL is just so much spin, isn’t it? The station is already far better connected to the tube via Waterloo or Victoria. I was not quoted “building a tube station” in the WG therefore I assume that you refer to our article above. But it is actually not me referring to a Tube Station but Martin Linton making a case for Grant Road entrance redevelopment. However I might be using a similar wording to refer to the fact, indeed that the ELL line will arrive at CJ in 2012. It will be on platform 1&2, therefore the closest platform to Grant Road, which could be nicknamed the main Tube entrance, whereas St John’s Hill will be the main Train entrance. – Overground service (frequency of overground services to be increased to 4 trains per hour from 2011) – plat 1&2 ? – Heathrow Link – plat 3&4 ? All additional traffic (people entering the trains at CJ and inter-change) has not been considered yet, and it can only be more evidence of the increasing necessity to improve the station with an appropriate development plan!